← Happily welcoming Frost, Leigh, Mara, and Stephanie to the TDI team! We are less than three months away from leaving and it is time to get to business. So many of the tangible things that we have put off as “we’ll get there when it’s time” have now come up. It is time. We are adding weight to our training, assembling our gear, registering with CouchSurfing.org, deciding what to do with the cars, coordinating a ride to Delaware (thanks Dad! ), and getting serious about packing up the house. (Good news side note, we’re pretty sure we have renters for the duration of our walk!) It is even time to open communications with facilities we hope to visit at the beginning of our trip. We are faced with two big questions at the moment. The first: Are we taking a support vehicle? The second: Should we straighten our line, forget Oregon, and cut across Nevada? When we started planning this thing about a year ago, there was not a question in our minds that we would have a support car with us. For days when it was too hot for the dogs to walk, for rescue in case of weather emergency, and to help us carry enough food and water so we wouldn’t have to weigh ourselves down more than necessary. We decided to take one of our cars (pending a vehicle being donated through some sort of a sponsorship program, of course). However, as we got deeper into planning the details of the walk, a support vehicle quickly revealed itself to be a luxury that is outside our means, at least for most of the trip. We have also followed the stories of two other unsupported cross-country trekkers, Nate Damm and Tyler Coulson, over the last year, and they have given us confidence by proving that it is possible. Nate set out alone and Tyler with his dog Mabel, both unsupported. Both walked and succeeded, and neither needed a support vehicle. Careful planning and the support of family and friends, new and old, was enough. Particularly in the east where towns are close together, John and I are confident. It is all friendly, familiar territory to us both. I grew up in Ohio and John in Kentucky. John and I have friends and family no further than 4 hours drive away from anywhere on our route between Delaware and Chicago. 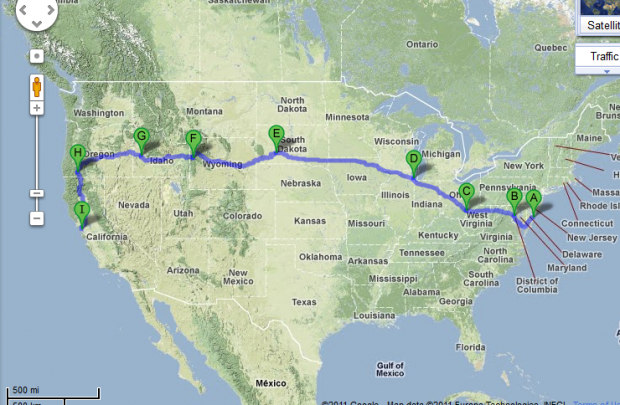 We have decided we can walk without a support truck, at least as far as Chicago. From there, we’ll see. It’s not bad, but we have a few adjustments to make. Some are based on the route of the American Discovery Trail and some changes are made to take us through areas we want to go through. With this plan, we get to hit most of the areas that are important to us while avoiding the worst of the mid-west summer heat. As we move closer to our departure date, we are also moving closer to securing non-profit status through a fiscal sponsorship. Everyone think happy thoughts for us! This would change everything and open up doors that are only available to officially charitable projects. We hope to do more than raise money to complete our walk and spread awareness for our causes. We want to raise money to donate to pet therapy and animal rescue and make a difference in a very real, lasting way. Eleven weeks and counting. Thank you all of our readers and loved ones for standing by us and being so tolerant of us speaking of nothing but this walk. Your support and patience means the world to us. This entry was posted in Preparations and tagged dog, dog safety, dog travel, therapy dogs international, training, travel, trip, tyler coulson, walk across america, walk with dogs. Bookmark the permalink. I have a deep empathy for your adventure and itinerary. If any time your wanderings bring you to the southwest, and the Sonoran Desert, it will be a pleasure to offer you refuge. Best of luck. so looking forward to spending time one the road with you next year! Hope you’re enjoying CO. Travel on, travel on. Googlemap it. This is a beautiful small-town route. 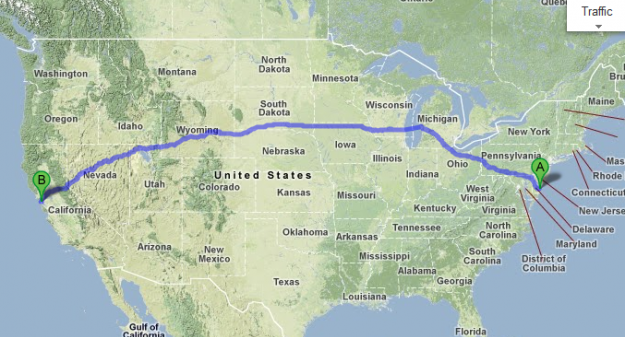 I’d take this route because it’s direct, I know good people in all those towns, and you skip around the Rockies pretty well. The Sierras are going to be a challenge no matter how you approach. Don’t miss the desert – it is truly my favorite place to sleep. It’s flat nothingness and stars and trains that run all night. And bugs. Do not forget about desert bugs. A friend of mine is a friend of yours, so if you end up in any of those places please let me know. Same goes for the Boise, ID area, Boulder, CO and Portland, OR if your travels take you to those places. Also, I’m sure Chicago is high on your list of spots not to miss, but personally I would skip it. I love Chicago, but big cities are hard on the nomadic way of life, in my own personal experience. I try to steer clear of them and the miles of surrounding suburbs when possible. I’d leave Athens, OH and then hit up the family connection in Muncie, IN before heading to Milo, which would fit in well and shorten the route. Hello cousin, thank you so much for your thoughts. It definitely sounds like a good plan – in truth, we have only really committed to this route as far as Chicago. Having this alternative presented to us is much appreciated. A small town route with friendly faces sounds pretty fantastic. In truth, I don’t have a particularly deep desire to walk through Chicago. I’ve been there before and am not a city person. However, a couple of the organizations we work with have facilities there where we want to make therapy visits. So, into the city we will most likely go. We may take a few days here to visit, see friends and family, and rest. As much as walking around in a city is not my favorite (this is mostly what our training has consisted of) there is something really amazing about walking out of them and back into the country. Thank you for your thoughts. I am still hoping you join us for some miles. I haven’t seen enough of your for at least the last 12 years or so. Love and miss you dearly. Wanted to wish you the best. I have two rescues, one is my Mobility Service Dog, both are Certified Therapy Dogs, both from Pawsibilities Unleashed from Frankfort, KY. My son and daughter-in-law took a year off work and couch-surfed their way thru South America, some of Europe, and parts of the Middle East (Europe was too expensive to do a lot there). It was an adventure of a lifetime, and they would heartily recommend couch-surfing. They developed some awesome friendships along the way, and the time together and hardships strengthened their marriage. I pray that this is a wonderful time for you. If you were coming to Georgetown/Lexington, KY, I would offer to feed you and put you up:) If you change your itenerary and come this way, let me know. Do you have an address or PO Box set up for a package? If so, besides a lil jingle in your pocket, what do you need?